If you’re in the food business, you’ve read the food-safety headlines. Watched the unfavorable stories. Seen the social media storms. These crises have happened to some of the best, most recognizable restaurants and manufacturers in the business. How they emerge on the other side of the crisis depends on their actions when times are tough. Through the years at Lee Esposito Associates, we’ve guided food and beverage industry clients through a variety crisis situations. From a chain restaurant that discovered after-hours shenanigans by employees that presented food safety and hygiene issues, to a manufacturer that was caught up in a recall by one of its partners, we’ve been on the front lines of some potentially damaging situations. As with most challenges in life, the key to effectively handling a food-safety crisis is preparation. What can you do to help ensure your team is ready, should disaster strike? Consider these strategies. 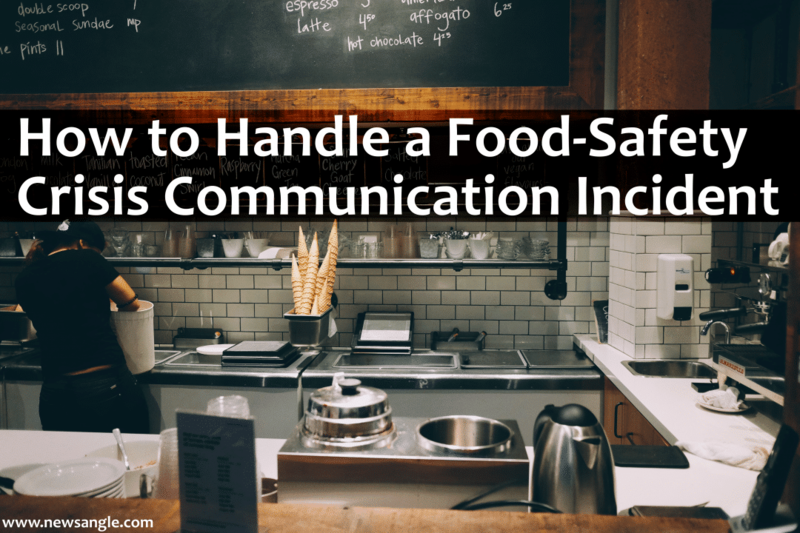 It’s critical to have your food-safety crisis communication plan in writing. Identify the crisis-management team members in advance, and practice communications and crisis response. Clearly define each team member’s responsibility. Miscommunication or a slow response can cause great harm during a crisis. As part of the plan, develop a checklist of procedures, and use it to run mock drills with key staff members. Your plan will be a living document that needs to be updated regularly. I suggest a quarterly review. Tip: Make sure your advance planning involves formal spokesperson training for key executives. The minute a food-safety issue arises, your team needs to isolate the problem to prevent it from spreading to other areas. These won’t be easy decisions, but they will benefit your business reputation in the long run. It may mean recalling products from grocery shelves, losing restaurant locations, or terminating a business relationship and changing vendors. On the flip side, if internal operating procedures led to the crisis, you might need to review and rework procedures to the point of finding an outside vendor. Tip: Bring in a food safety expert to review your operations, and ask for suggestions to improve. Honesty is always the best policy when dealing with the media, especially in a food-safety crisis. It’s critical that your business be the first to deliver the bad news. You don’t want it breaking across social media platforms and coming from someone else. Nothing can be worse than letting others define the nature and extent of a crisis. This is where all your hard work building a trusting relationship with key reporters comes into play. Appoint a spokesperson to tell the press about the problem. Never say things that are not true or can’t be verified. Do not get angry, defensive or—worst of all—attack the interviewer, especially if video is involved. You will only make for good television and become an “Internet sensation,” while hurting your career and the reputation of your brand. It is critical that you show compassion for those affected. A food-safety crisis is a human issue, and putting a human face on the company and issue is imperative. Tip: Have Health Department reports ready to share with the media. Immediately after (or, if possible, at the same time) the mainstream media has been advised, and the crisis team is assembled, post a statement across key networks. Social media comments during a food-safety incident will fall into two categories: angry consumers and sympathetic fans of your brand. Avoid becoming defensive and commenting back to people lashing at you on your social media network, because it’s likely your comments will go viral. Instead, follow the comments closely, as they may tip you off to other unknown operational issues or simmering hotspots of the crisis you might have missed. If you’ve acted with the public’s best interest at heart, and you’ve created a loyal social network following, your online comments might be sympatric and supportive, which means you will need to reply to all. Simply clicking “Like” or a thumbs-up emoji might be all you need, but these supportive comments also will need to be tracked and perhaps reviewed in some qualitative manor. Throughout the crisis, post regular updates on your social media platforms, letting your followers know when you’ll reopen or when consumers will again find your brand in grocery stores. For example, say you’re sorry and that the issue has been a painful learning experience that has taught the entire organization how to do a better job. Avoid blaming others, even if the crisis was caused by a careless employee or vendor. Tip: Keep tabs on the social conversation using a monitoring tool, such as Hootsuite. A crisis can hit anyone at any time. Have an undated boilerplate of your company ready to send to the media as soon as all the facts are known. As with newspapers that have pre-written obituaries of famous people, you should have the media alert in rough draft form, listing key landline and mobile numbers, emails, and online contact information. Tip: An updated media list is important; it will save precious minutes telling your story before someone tries to tell it for you and puts a negative spin on it. Looking for more media tips? Read our post on generating media coverage in a digital world.